One of the key components to keeping your cat or kitten healthy is feeding them a healthy diet that meets their nutrition needs. Part of a healthy diet includes water for hydration. Did you know that including wet food in your cat's diet is very important? 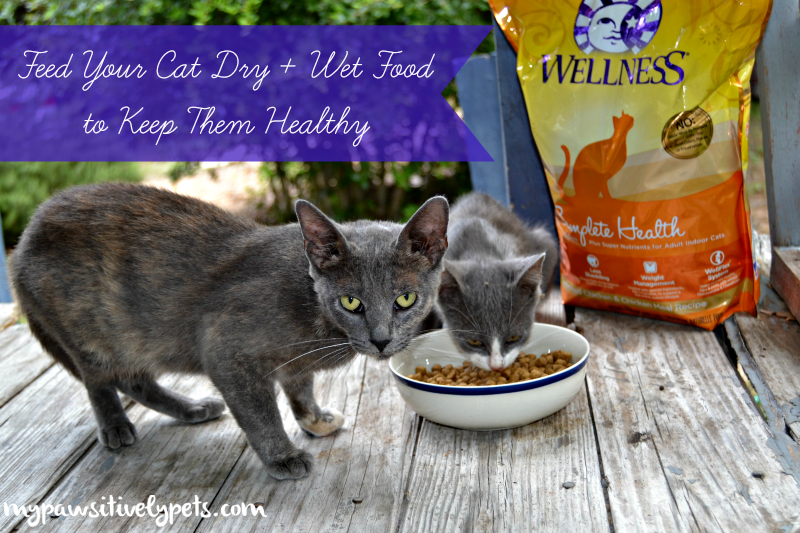 Wet cat food will give your cat additional moisture and help keep them hydrated. This is especially important for some cats who may not like to drink much water. For over a decade, Wellness has provided pet parents with healthy pet foods to create a a foundation of wellbeing. All Wellness recipes are free from corn, soy, wheat, artificial colors, and artificial flavorings. When I worked as a Veterinary Technician, a popular question from our clients was "What's a good brand of pet food for my dog or cat?". 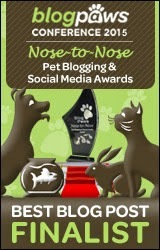 My favorite veterinarian, whom I often assisted, usually recommended Wellness pet food brand. 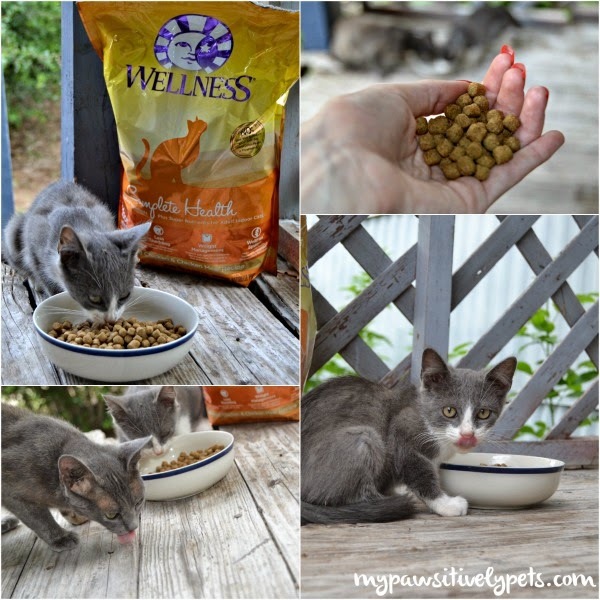 When offered the chance to try some Wellness cat food and share it with Pawsitively Pets readers, I was overjoyed. I had to employ a couple of taste testers of course, so I introduce to you Smudge and Oso. They are my mother's cats. Smudge is a gorgeous charcoal colored Tortie and Oso is a delightful little gray tuxedo kitten. As mentioned above, keeping your cat hydrated is important. That's why it's good to feed them wet cat food along with their dry food. Wellness Divine Duos help promote hydration for your cat. Cats do not have a strong thirst drive, which is why it's important for them to take liquids with their meals. Wellness Divine Duos include the same nutrition as their dry cat food formulas, making them a perfect addition to your cat's diet. 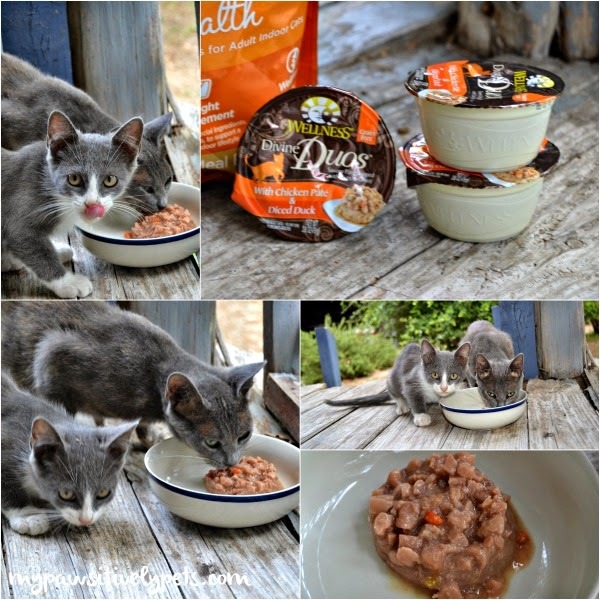 Smudge and Oso shared a bowl of Wellness Divine Duos Chicken Pate & Diced Duck wet cat food and gobbled it right up! They absolutely loved it! 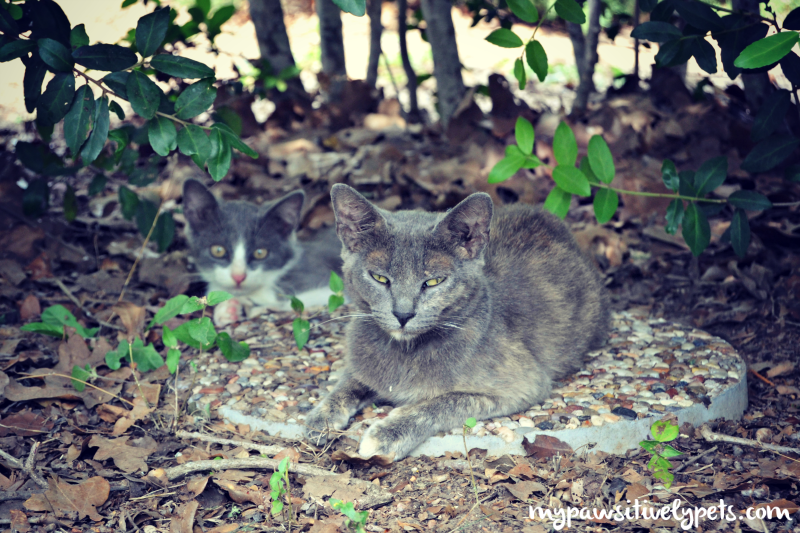 Because these two kittens spend some time outdoors, eating wet cat food will be good to help keep them hydrated this Summer. In addition to feeding your cat moisture rich foods, you can also give them a healthy dry food. Smudge and Oso were also delighted to munch on some of the Wellness Complete Health Indoor Health dry cat food. You can also check out Wellness Complete Health Salmon, Salmon Meal, & Deboned Turkey Recipe. After a very filling lunch, Smudge and Oso were ready for a nap in the yard. I feel good knowing that they are going to be eating healthy with Wellness dry cat food and staying hydrated with the Divine Duos wet cat food. Wellness is a pioneer in holistic pet nutrition that seeks new ways to help pets thrive, educate people about the importance of a healthy lifestyle for their pets, and supports animal wellness programs. 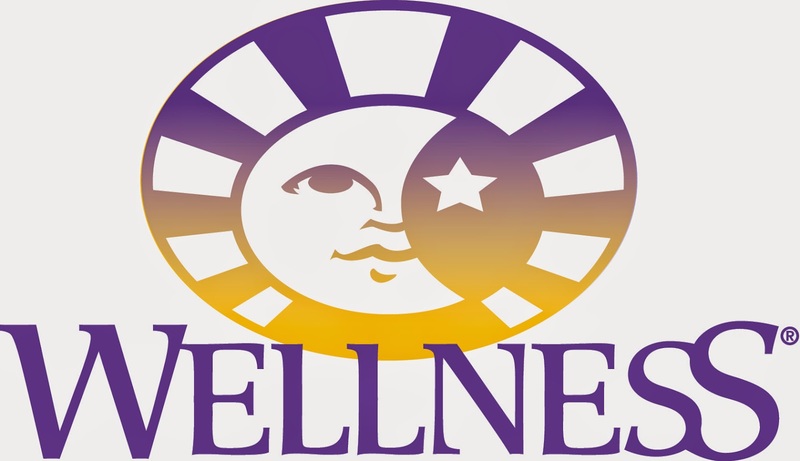 You can keep up with Wellness on Facebook or visit their helpful FAQ page here to learn more about them. 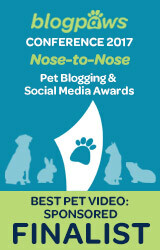 This post is sponsored by Wellness and the Pet Blogger Network. I am being compensated for helping spread the word about Wellness, but Pawsitively Pets only shares information we feel is relevant to our readers. Wellness is not responsible for the content of this article. It looks totally tasty :o) No wonder that they liked it and that they look so satisfied in their yard :o) Thanks for a great review! We eat both wet and dry...more wet though. We've been hearing and seeing good things about the Duos. We'll give it a try! Our cats are set on food for now, but your kitty models sure are adorable! 1 year ago, my one male cat (Winter) had a huge scare! I had not realized how impawtant wet food in a kitties diet actually is. He has crystals, and a blockage, and the whole 9 yards. He very suddenly became lethargic, and incredibly sick looking, in a matter of one day! The vet said if we didn't rush him in when we did, he would have died. Even when we brought him there, they had told me that they would euthanize him if I wanted because to try and help him would be a lot of money. I said HECK NO! Fix my baby! So they drained his bladder, did a bunch of stuff, and sent us home with prescribed Valium and prescription wet food, and he pulled through! I will NEVER make that mistake again! Yes, those are definitely medical emergencies and I know how scary and expensive they can be. Sorry you learned the hard way, but glad that he was able to make a recovery! If I was a cat I would definitely eat that! Our cats get a combo of wet/dry of their special diet to help keep them healthy. Was I the only one who tried the salmon kibble? MOL! All I ever eat is fish and I’ve never needed a dental. *knocks TW’s head for wood* Did they eat the carrots? I SHOULD have gotten the salmon kibble CK, and wish I had. Regardless, the kittens still loved it. They licked their bowl clean :) I guess they are not as picky as you! Thank you for the reminder and encouragement to feed my cats wet food. I don't do that very often and will make a point to buy more canned. The good news is one of our favorite brands is Wellness. I buy dry food from that company often and like to mix up which variety I buy. Cutest photos ever! I am so jealous your mom has a kitten! Adorable! I know, I was so happy to get my kitten fix on! Getting my kitty to try new foods is nearly impossible. She is set in her ways...lol. Wet food in your cats diet is soooo important, thank you for writing this! It definitely looks like it was a hit with Smudge and Oso. What cuties they are! The one in the front of that last photo looks so much like my first cat, Concha, I always thought she had unique coloring and don't see a lot of cats quite the same. 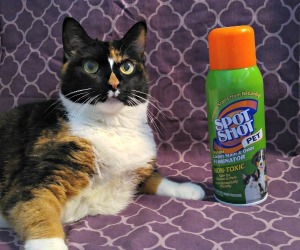 Yea, the tortie is really pretty! My mom doesn't think she's that pretty and I tried to explain the whole tortie/calico thing to her and how that grey tortie wasn't too common. nope.. sorry. I can't not comment. Dry food is NOT healthy for a cat. A cat is a desert creature and as such has a low thirst drive. Feeding a low moisture food actually creates chronic dehydration. In order to get the kibble to keep the shape, they need to include a lot of plant based materials. For obligate carnivores, this is a serious problem. Cats lack the digestive enzymes to break down plant based ingredients so there for the nutrients we recognize as healthy in these plants are actually inaccessible to the cat. nope.. dry food is not part of a healthy diet for cats. A convenient diet yes.. but not healthy. Thanks for leaving your thoughts Connie, I know you are well versed in cat nutrition. So many people feed or are going to feed dry food regardless and I think that most of them don't realize they need to add more moisture by at least giving some wet food with it. I know these kitties are getting way better nutrition than what they were probably getting before - leftovers and low quality kibble. You really should only feed cats wet food. Dry kibble is a big problem for animals with such low thirst drives and can cause quite a few urinary tract issues.